Another great thing about this cake is that it needs no mixer!! You can mix this all by hand it it will come out beautiful! I love not having to much a big ol' mixer out when I just a simple cake. The only thing that needed a bit of extra love were the pistachios. I don't know about you but I love love buying my nuts at Trader Joe's. Their selection is great plus I find that their prices are cheaper than most supermarkets. I had this bag of dry roasted unsalted pistachios in my pantry for about two weeks till I decided I need to finally use them! I threw 1/2 cup of the dry roasted unsalted pistachios into my mini food processor and pulsed until I find a pretty fine grind. This goes into a bowl along with the flour, sugar, baking powder and salt. Whisk up these dry ingredients and then its onto the wet. In a separate bowl, whisk together the ricotta cheese, eggs and the vanilla and pistachio extract. 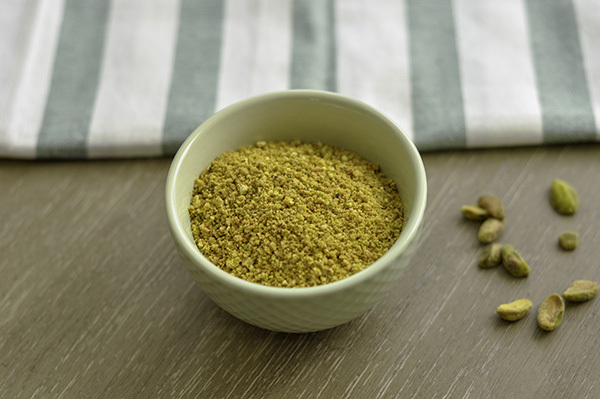 If you can't find pistachios, you can also sub it out with some almond flour and almond extract! Equally special and totally yummy! Add the wet ingredients into the dry and fold together until combined. Then add in the melted butter. It takes a bit to get the butter folded in, but it will come together! Then add about 2/3 of the frozen cherries. Pour this batter into a parchment lined springform pan. (You can also use a regular cake pan, but I thing unfolding it from a springform pan much easier. )Then place the remaining cherries over the top of the batter. Bake this at 350F for about 55-65 minutes or until an inserted toothpick comes out clean. Allow to cool for 20 minutes before removing the cake from the pan. Sprinkle with some powdered sugar and enjoy this moment of bliss with a cup of tea of coffee... or just a big glass of ice cold milk! Preheat oven to 350°. Line a 9”-diameter springform cake pan with parchment paper and lightly coat with nonstick spray. In a large bowl whisk together the ground pistachios, flour, sugar, baking powder, and salt in a large bowl. Then in a separate bowl, Whisk eggs, ricotta, pistachio extract and vanilla extract in a medium bowl until smooth; fold into dry ingredients just until blended. Then fold in butter, followed by 2/3 cup of the cherries. 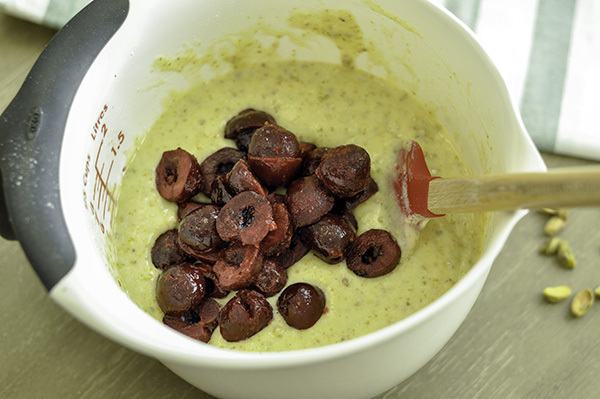 Pour the batter into the prepared pan and place the remaining 1/3 cup cherries on top. Sprinkle with some powdered sugar and enjoy!